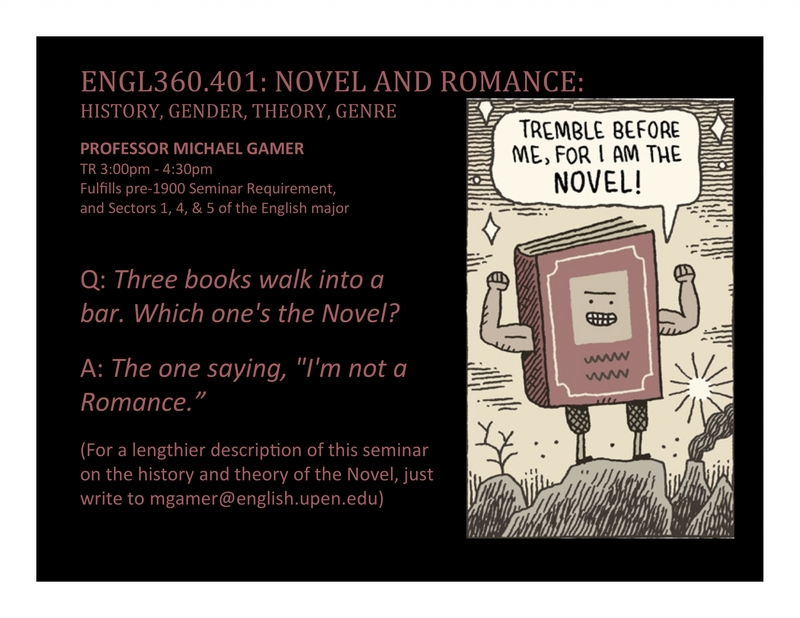 This seminar introduces students to the history and theory of the novel by tracking its historical relation to its even more popular cousin, romance. A little over half of the time we will reading works of fiction; the remainder of our time we'll devote to reading the full trajectory of histories and theories of fiction. Gender will matter here; so will ideas of high and low culture, literary status, and cultural genealogies. What is real and what is fantasy, and how have our ideas of this changed over time? Readings in fiction will span the eighteenth and nineteenth centuries, and may include novels by Defoe, Smollett, Burney, Austen, Scott, Bronte, Dickens, and Collins, along with theory and criticism by Lukács, Bakhtin, Auerbach, Watt, Barthes, Jameson, Moretti, Lynch, Armstrong, Gallagher, Woloch, and more. Assignments will be short essays, a presentation, and a research project.